The televised account of this week's summit had an epic air, using triumphant music to underscore its gravitas - perhaps a fitting stylistic touch for the first-ever meeting of sitting leaders of the United States and North Korea, despite recent tensions. Presidents aren't required to return salutes to military personnel, even American soldiers. North Korean state television aired a 42-minute long documentary on Thursday that offered a different view of Kim Jong Un's meeting with President Donald Trump in Singapore. The KCTV documentary also showed events largely from Kim's perspective, from his departure from Pyongyang aboard an Air China plane on Sunday, to his arrival in Singapore, where he was greeted by Foreign Minister Vivian Balakrishnan and his being whisked through the city past large crowds of onlookers. In a voice-over, North Korea's famous newsreader Ri Chun-Hee said that the size of the crowd was "unprecedented" for Singapore. Kim is shown relaxing in a luxurious suite at the St. Regis Singapore, the five-star hotel where he stayed. He later goes to visit Singapore's prime minister, Lee Hsien Loong. Footage is also shown of an evening sightseeing trip around the city with Balakrishnan that took place on Monday. Trump does not appear in the documentary until almost halfway through, when he is shown entering the Capella Singapore hotel on the resort island of Sentosa for talks with Kim. Most of the footage of the summit itself is similar to that which was captured by international news agencies. However, KCTV did capture one moment (which takes place at 22:35 in the video) that was largely missed by American audiences. When meeting No Kwang Chol, North Korea's minister for the People's Armed Forces and a top military leader, Trump initially tries to shake his hand. No pulls his hand back and then salutes the president. 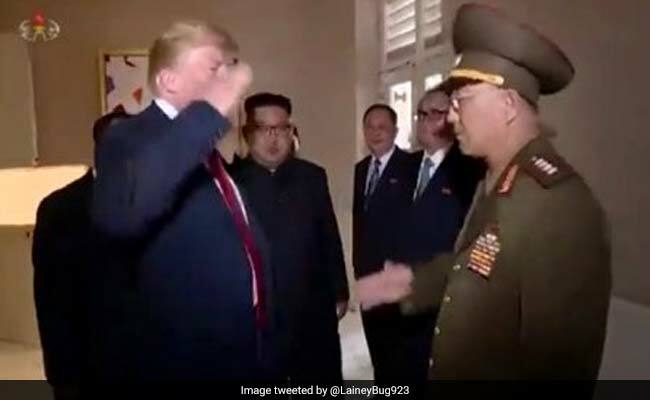 Trump then responds with his own salute in return, before the two men shake hands as Kim smiles in the background. Presidents aren't required to return salutes to military personnel, even American soldiers. (Ronald Reagan supposedly started the tradition of the president regularly returning the salute to members of the American military.) And it is highly out of ordinary for a president to return the salute of a foreign military member. The rest of the documentary shows how the rest of the meeting unfolded, before finishing with Kim flying back to Pyongyang where he is greeted by a large, cheering crowd. Though it is shown from the North Korean perspective, the documentary largely shows Trump in a flattering light - at one point Ri describes the president and Kim as "two supreme leaders" of their countries. As is Korean custom with elders, Kim is shown making deferential gestures toward Trump, who is more than twice the age of the North Korean leader. Notably, like a recent KCTV documentary that showed Kim's visit to Dalian, China, for his second meeting with Kim Jong Un, North Korean state media didn't shy away from showing how much more developed foreign cities were than Pyongyang. There were multiple shots of Singapore's gleaning skyline in the documentary; Kim was shown visiting tourist wonders like the Gardens by the Bay. However, North Korean state media has generally taken a different stance on the outcome of the summit than the Trump administration - with newspapers portraying denuclearization as a "step by step" process and suggesting that the president had agreed to halt U.S.-South Korea joint military exercises under pressure from Kim. With its focus on Kim, the KCTV documentary seems to show North Koreans that their leader is star of the show.